Once referred to as "the most beautiful place on Earth" by National Geographic Traveller, the Dingle Peninsula (also known as West Kerry, or Corca Dhuibhne in Irish), is the northernmost of the two major peninsulae in County Kerry, Southwest Ireland. Dingle coastline. Famed for its rugged beauty and indigenous cultural heritage, the area has long been a holiday destination, drawing both Irish and foreigner visitors alike. In fact, the Dingle Peninsula has been rated amongst Tripadvisor's top 100 global destinations, while Dingle Town has been recommended as one of the best places to spend New Year's Eve by Lonely Planet Guide. 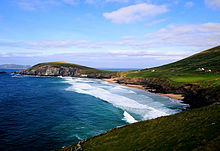 This article uses material from the Wikipedia article "Dingle Peninsula", which is released under the Creative Commons Attribution-Share-Alike 3.0 License.